Vanderbilt University Spirit is an integral part of the Athletic Department, the University and the greater Nashville community. 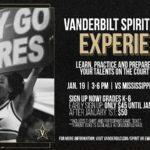 Vanderbilt Spirit takes pride in their goals to raise and promote school spirit and support for Vanderbilt University. Vanderbilt Cheerleading and Dance Team participate in many on-campus events including Welcome Week and Homecoming. Our program prides itself on serving as ambassadors to the University and Athletic Department.